Moscow mule cocktail may be a simple blend of vodka lime juice and ginger beer, but how you serve it really matters. As you may be aware, not just any mug may be used to serve this drink. For the best experience, Moscow mule should be served in a copper mug. It is said that using copper enhances the flavor of ginger beer and vodka (Source). This makes the choice of the right mug for Moscow mule cocktail daunting, especially for starters. While shopping for the best mug for this cocktail, you need to consider such aspects as the built quality and material, interior lining, sized as well as type of finish on your mug. Hand crafted items will never cease to be so precious. 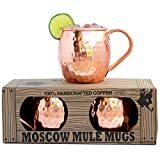 If you are looking forward to sipping your cocktail from some of the best Moscow mule copper mugs, you should go for hand crafted mugs. 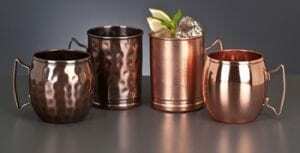 The Advanced Mixology Moscow Mule Copper mugs are a good example, in this regard. This set comprises of two gorgeous copper mugs that have been hand crafted for the best antique aesthetics. Again, you will be pleased to learn that these mugs are made of 100 percent copper. Each of the individual cups in this set is thoroughly wrought and polished using hands. Having been crafted by some of the best craftsmen in the industry today, these pieces are surely appealing. With regard to the finish, these Advanced Mixology mugs depict a unique tarnish that will not fade away with time. The mugs are made from pure copper, which is heated and tempered before it is polished a couple of times by the experienced craftsmen at Advanced Mixology. For finer details and a unique luster, the product is then hammered by hand. The individual mugs have relatively thicker walls and feature gracefully shaped handles. The handles are specifically crafted to fit perfectly in your hands. These handles are welded to the mug body. as such, you will not experience any leaks associated with poorly done riveting. Looking for a mug that can hold more Moscow mule per serving and still leave some space for ice cubes? If so, you should consider buying the best 18 ounces Moscow mule mugs, such as the RV Hammered Mug. What’s more fascinating about these mugs is the fact that no two mugs are identical. This is mainly because they are handmade. The RV Hammered Copper Mugs are made in India, but are of high quality and handcrafted for superior aesthetics. The set of four handcrafted mugs is a real compliment to the traditional Moscow mule cocktail. Again, the appeal of these mugs is further enhanced by their affordability. For less than $25, you will get yourself a set of 4 handcrafted copper cocktail mugs. Are you afraid of consuming copper traces in your drink? These Hammered mugs feature a high quality nickel lining to prevent the copper from reacting with your Moscow mule. Again, the nickel interior lining of these cups has been proven to keep drinks colder for a longer period. Since its foundation, the Advanced Mixology manufacturer has been producing some of the best handcrafted products in the industry today. 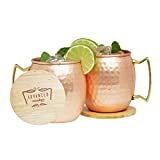 In this regard, the Moscow Mule Gift Set 100% Pure Copper 1/2 Pound Mugs are made using the best practices and materials. Rather than having mass-producing machines, the manufacturer used experienced artisans to craft their mule mugs using hands. Just like the Advanced Mixology Pure Copper Mugs reviewed above, these mugs are also made of high-quality pure copper. The copper sheets are heated, tempered and polished severally by the experienced master craftsmen at Advanced Mixology. While these mugs are primarily meant for Moscow mule cocktail, they may also be used to hold other cold drinks. In addition to the four copper mugs, the package will come with a hand-crafted wooden coaster. This goes a long way in ensuring that you get the best value for money. The product will come in a beautiful and classy white gift box. Copper mugs are loved by many for Moscow mule cocktail. One of the reasons is because of their conductivity, which makes them ideal for chilled drinks. These Old Dutch copper mugs are made of copper to ensure that you get a long-lasting cooling experience with your Moscow mule cocktail. This chilling effect has been proven to keep drinks cold for longer. The mugs by this manufacturer feature an original design and are made of traditional solid copper. The product comes in a fairly-colored Old Dutch box with a Moscow mule recipe on one side. to ensure that you have purchased the original product, you should look out for the ODI logo on the box as well as on the product itself. A considerable number of the best Moscow mule mugs today are relatively lightweight. Contrary to this norm, the Morken Barware Mug is heavier. Weighing over 1.5 pounds, you can actually feel the exceptional quality they boast of. Although it features an all-copper construction, this is one of the most affordable products you can buy today. Since they are made using pure copper, these mugs tend to have a red or rose copper shade. The copper handles on these mugs are welded, rather than riveted to make the mugs water-tight. The base of the mugs is beveled to reduce the surface it will occupy on your table. Do you love cocktails? Then you probably know that the sipping experience depends on much more than just the alcoholic content of the drink. If you would like to spice things a little bit, you should consider buying the right mug for your Moscow mule. In the 1940s, Moscow mule was mainly served in copper mugs for enhanced flavor. Since then, copper mugs have been a necessity for the drink. Now that you are looking for the best Moscow mule mug, you must have realized that there are numerous options in the market. How large or small would you like your Moscow Mule mug to be? Well, the best mug capacity will mainly depend on your individual preferences. While this is the case, most of the mugs meant for Moscow mule have a capacity of 16 ounces. You may think of such a capacity as the medium size because the mug is neither too big nor too small. Most consumers also find the 16-ounce capacity ideal. Mugs of this capacity are able to hold the drink, along with a few ice cubes without spilling the drink. However, you may also decide to go bigger up to 30 ounces or smaller up to 12 ounces. All in all, it is advisable to buy a mug that can 1 ounce of lime, 2 vodka ounces and still have space for ginger beer and ice. What type of copper is used to make the surface of your preferred Moscow mule mug? In this regard, you need to check whether the mug is entirely made of copper or not. Again, you should check to see whether the copper surface is polished or not. Based on your preferences, you should also choose the copper shade you find appealing. 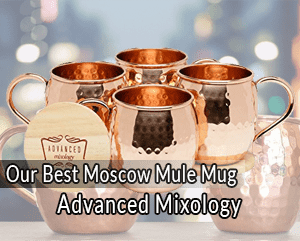 If you are after the best quality mug for Moscow mule, it is advisable to go for the mugs made of 100 percent copper. These can only be purchased from the reputable sources, such as Amazon. Mugs made of 100 percent copper feel premium to hold and offer the best value for your money. If you are after affordability, you will have to settle for mugs that are not entirely made of pure copper. Such mugs often have lacquer or plating to line the inner side of the mug. Such a lining is meant to prevent the material from affecting your cocktail. Again, such materials are meant to prevent oxidation on the surface of the cup and to prevent it from tarnishing. The leading Moscow mule mug brands today use nickel to line the interior of the mug. While copper is the material traditionally used for Moscow mule cups, it reacts with acids, including some cocktail ingredients. The acidity of Moscow mule cocktails falls below 6 in the pH scale. As such, it will react with surface, if poured into a mug with a copper interior. Without a nickel coating on the interior of the cup, the cocktail will end up corroding it from the inside as time goes by. When this happens, the copper leaches into your drink and you end up consuming it. According to the U.S. National Institutes of Health, consuming high doses of copper can have a negative impact on your health. Early symptoms of excessive copper consumption include nausea, diarrhea, jaundice and abdominal pain. This being the case, it is advisable to go for the mugs that have a high-grade lining of nickel on their interior. All the available Moscow mule mugs have their handles either riveted or welded to the body of the mug. Cups with welded handles are relatively costlier than those with riveted handles. When properly done, the welding ensures that the cup does not leak your precious cocktail. Riveting, on the other hand is cheaper than welding. As such, mugs with riveted handles are comparatively cheaper. However, you need to know that the rivets themselves are not made of copper. Again, the riveting process involves punching a hole into the body of the mug. If not properly done, the rivets will be constantly leaking whenever you pour a drink into the cup. You do not want to buy a Moscow mule mug only for it to peel the copper coating and expose a stainless steel surface after a while, right? To avoid such an inconvenience, there are several things that you need to consider while shopping or one. While some consumers emphasize on the affordability of the product, you need to balance this with the product quality. 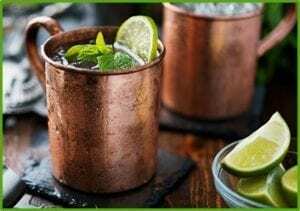 If you are looking for the best Moscow mule copper mug, this guide will help you choose the right one. Also, check out our guides for Kitchen Faucets out there!